It is encouraging that there is now widespread agreement across the political spectrum that the key economic challenge is middle-class income stagnation. To address this stagnation we must confront two underlying trends. The first is to address the ongoing but incomplete jobs recovery from the financial crisis that Wall Street inflicted on the global economy. The second trend is the stagnation of wages for the vast majority of workers since the late 1970s, an era of “wage suppression.” That wage trends lay at the heart of income stagnation is just common sense. After all, middle-class families rely almost completely on what they earn from their jobs to support their consumer spending. These families do not own many financial assets that produce income; at best they have a little stock (only one-third of households have more than $5,000 of stock), and their home accounts for most of their wealth. This is also true for low-income households, who obtain 70 percent of their income from wages (including the Earned Income Tax Credit). Raising households into the middle class and fueling middle-class incomes thus boils down to generating widespread wage growth. The goals that economic policy must focus on are, thus, creating jobs and reaching robust full employment, and generating broad-based wage growth. The good news is that 246,000 jobs were created on average each month in 2014, faster than any year in the last recovery and since 2000. This job growth lowered unemployment to 5.6 percent in December. Unfortunately, we still have far to go before we recover from the financial crisis of 2008 and the recession that started after December 2007. Specifically, the Great Recession and its aftermath have left us with a jobs shortfall of 5.6 million—that’s the number of jobs needed to keep up with growth in the potential labor force since 2007—and current job creation rates will get us to pre-recession labor market health in August 2016.1 And even attaining this pre Great Recession labor market health is an insufficiently ambitious final goal – instead we should strive to reach genuine full employment with roughly 4 percent unemployment. Much is at stake.2 If we do not attain robust full employment then many communities, particularly those of color, will be left out of the recovery. Moreover, under current policy conditions significant wage growth for the vast majority may only occur when we achieve much lower unemployment than we now have. 1. The Federal Reserve Board needs to target full employment with wage growth matching productivity. The most important economic policy decisions being made about job growth in the next few years are those of the Federal Reserve Board as it determines the scale and pace at which it raises interest rates. Let’s be clear that the decision to raise interest rates is a decision to slow the economy and weaken job and wage growth. There are many false concerns about accelerating wage growth and exploding inflation based on the mistaken sense that we are at or near full employment. Policymakers should not seek to slow the economy until wage growth is comfortably running at the 3.5 to 4.0 percent rate, the wage growth consistent with a 2 percent inflation target (since trend productivity is 1.5 to 2.0 percent, wage growth 2 percentage points faster than this yields rising unit labor costs, and therefore inflation, of 2 percent). The key danger is slowing the economy too soon rather than too late. Even at 4 percent unemployment, there will be many communities that will still be suffering substantial unemployment, especially low-wage workers and many black and Hispanic workers. To obtain full employment for all, we will need to undertake policies that can direct jobs to areas of high unemployment. The tool for this is the public and non-profit employment programs that several members of Congress have introduced in the last several years that create jobs by meeting unmet needs. There is widespread agreement that we face a substantial shortfall of public investment in transportation, broadband, R&D, and education. Undertaking a sustained (for at least a decade) program of public investment can create jobs and raise our productivity and growth. In the early years this program would most effectively create jobs if we borrowed to finance it, but as we approach full employment we can raise revenues to cover its costs. In this way budget policy can be a tool to allow us to raise productivity and bring us closer to full employment. The annual U.S. trade deficit in goods and services increased from $476.4 billion in 2013 to $505.0 billion in 2014, an increase of $28.6 billion (6.0 percent). That deficit represents a huge reduction in U.S. GDP and employment. By making imports cheaper and U.S. exports more expensive, currency manipulation inflates the trade deficit and leads to huge job losses. Eliminating currency manipulation could reduce the U.S. global trade deficit by between $200 billion and $500 billion each year, which could increase overall U.S. GDP by between $288 billion and $720 billion and create between 2.3 million and 5.8 million U.S. jobs. There are many false claims that corporate tax reform is needed to make us competitive and bring us growth. First off, the evidence is that the corporate tax rates U.S. firms actually pay (their “effective rates”) are not higher than those of other advanced countries. Second, the tax reform that is being discussed is “revenue neutral,” necessarily meaning that tax rates on average are actually not being reduced; for every firm or sector that will see a lower tax rate, another will see a higher tax rate. It is hard to see how such tax reform sparks growth. 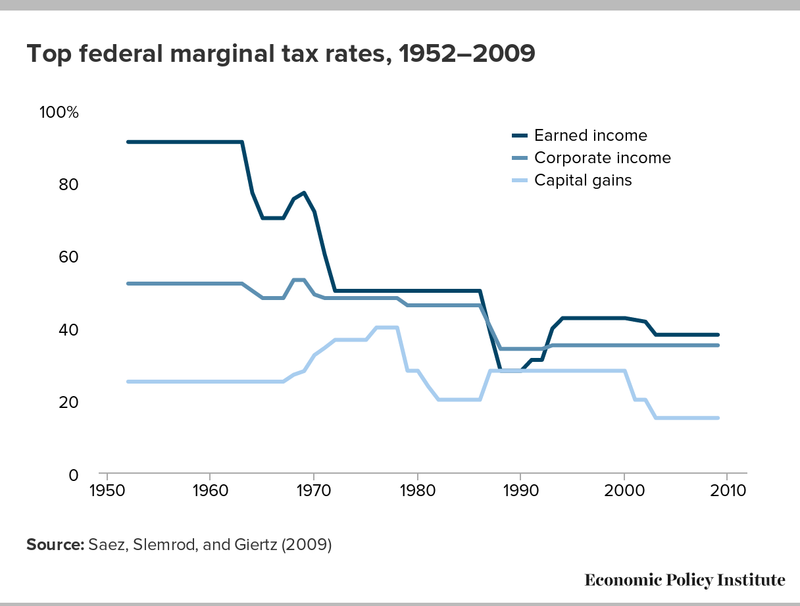 There will surely be many efforts in this Congress to cut corporate taxes and reduce taxes on capital income (e.g., capital gains, dividends) and individual marginal tax rates, especially on those with the highest incomes. It’s easy to see how those strategies will not work. Look at Figure 1, which shows that these taxes have been reduced over the last 35 years since 1980. Yet, economic growth was slower since 1980 than in the preceding 30 years, when tax rates were much higher. Another useful comparison is to the last recovery following the Bush era tax cuts, which had slower job growth than the current recovery. There are those worried about inflation who are calling on the Federal Reserve Board to raise interest rates soon and steadily thereafter. Their fears are, in my analysis, unfounded. But we should be clear that those seeking higher interest rates are asking our monetary policymakers to slow economic growth and job creation and reflect a far-too-pessimistic assumption of how far we can lower unemployment, seemingly aiming for unemployment at current levels or between 5.0 and 5.5 percent. We can do better than that, and the failure to seek significantly lower unemployment would toss away the opportunities for wage growth and employment for many who otherwise would not benefit from this recovery. NAFTA cost U.S. workers almost 700,000 jobs, and since the Korea–U.S. Free Trade Agreement, our trade deficit with Korea has surged more than 80 percent, which equates to the loss of more than 70,000 U.S. jobs. The U.S. goods trade deficit with Korea increased 20 percent in 2014 to more than $25 billion, while 2014 exports to Korea were lower than before we entered into the KORUS trade agreement. China’s admission to the WTO has been a disaster for U.S. manufacturing workers: The U.S. goods trade deficit with China increased by $23.9 billion (7.5 percent) in 2014, to $342.6 billion. Clearly, further trade deals that follow the NAFTA and Korea pattern should be avoided. Their failure to address currency manipulation or to effectively address labor standards, while exalting the interests of multinational corporate investors, has been a disaster that should not be repeated. These trade treaties are not even about trade, given that tariffs are already very low: they are about backroom deals to protect corporate profits and establish new rights. Giving the president fast-track authority to negotiate the Trans Pacific Partnership (TPP) would be a mistake. It is a welcome development that policymakers and presidential candidates in both parties have now acknowledged that stagnant wages are a critical economic challenge. This will generate an important debate on the best way to lift wages for the vast majority. It is useful to establish some of the basic facts. 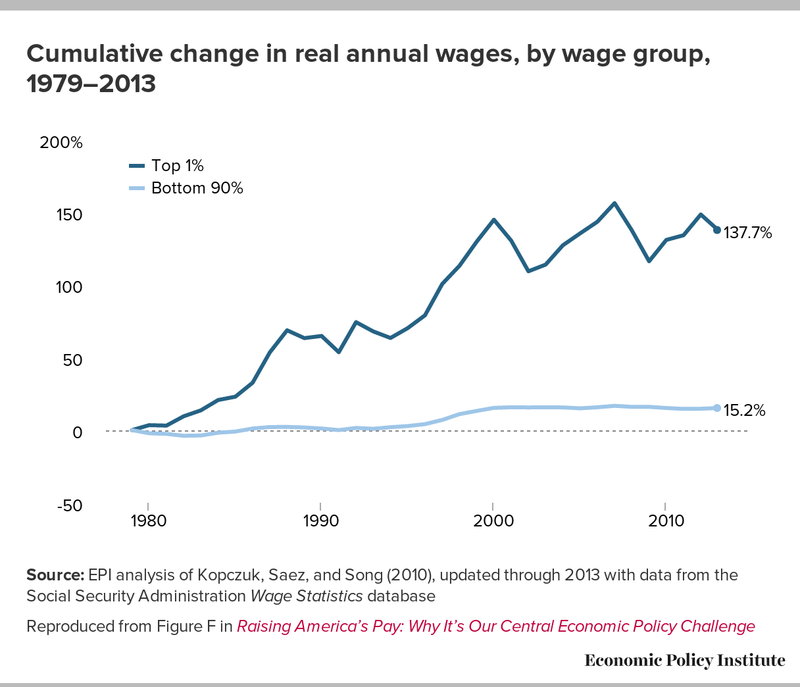 Figure 2 illustrates the tremendous gap between the 138 percent wage growth enjoyed by the top 1 percent since 1979, and wages for the bottom 90 percent, which grew just 15 percent, with most of that growth occurring in the late 1990s. Figure 3 presents the divergence between productivity—the growth of the output of goods and services per hour worked—and the pay of a typical worker. 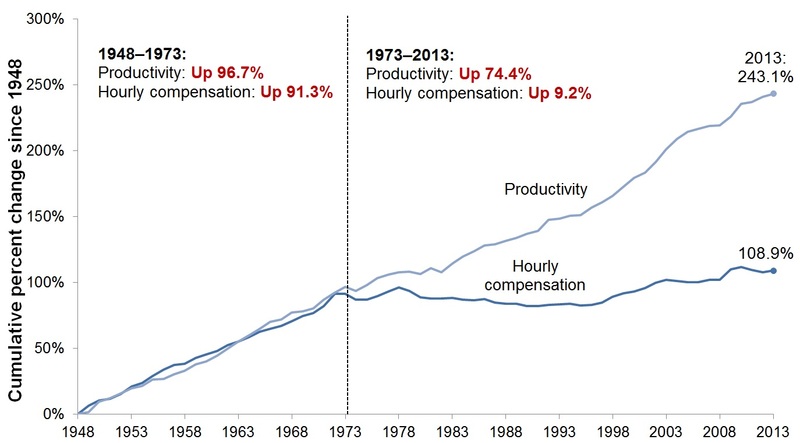 Over the 40 years since 1973, there has been productivity growth of 74 percent, yet the compensation (wages and benefits) of a typical worker grew far less, just 9 percent (again, mostly in the latter 1990s). Thus wage and benefit stagnation is a long-term trend (Figure 4) and one that is not due to insufficient economic growth, since the economic growth over the last four decades did little to produce rising pay for the vast majority. Last, it is important to note that there has been widespread wage stagnation for the last 10 years or so, affecting both blue-collar and white-collar workers and both high school and college graduates. Wage stagnation occurred over the last recovery from 2002–2003 until 2007 as well as during the Great Recession and its aftermath. Note: Data are for compensation (wages and benefits) of production/nonsupervisory workers in the private sector and net productivity of the total economy. "Net productivity" is the growth of output of goods and services less depreciation per hour worked. Updated from Figure A in Raising America’s Pay: Why It’s Our Central Economic Policy Challenge, by Josh Bivens, Elise Gould, Lawrence Mishel, and Heidi Shierholz, Economic Policy Institute, 2014. Wage stagnation is conventionally described as being about globalization and technological change, explanations offered in the spirit of saying it is caused by trends we neither can nor want to restrain. In fact, technological change has had very little to do with wage stagnation. Such an explanation is grounded in the notion that workers have insufficient skills so employers are paying them less, while those with higher wages and skills (say, college graduates) are highly demanded so that employers are bidding up their wages. We know that these trends have not been in play over the last 15 years. Many studies (including those by Frank Levy and Richard Murnane; by David Autor; by Beaudry, Green, and Sands; and by Mishel, Schmitt, and Shierholz) have shown that the best-paying occupations have not expanded their share of employment since 1999–2000, and that job growth has been centered among low-wage occupations.3 The so-called job polarization that has been much discussed (eroded jobs in middle-wage occupations but expanded jobs at the top and bottom) has not been present in the United States since the 1990s. So, employers are not creating jobs at the “high end,” yet we see wages grow far faster for those at the top (the top 1 percent as well as the top 10 percent) than in the middle or bottom of the wage scale. It is also important to note that the inflation-adjusted wages of college graduates have been stagnant since 2002–2003, the wages and benefits earned by recent college graduates have been plummeting for every new cohort since 2000, and the Federal Reserve Bank of New York has documented that an increasing share of recent college graduates work in jobs that do not require a college degree.4 Last, there are hundreds of thousands of college students and recent college graduates working in internships that provide no wage. A number of these unpaid internships in the private sector are likely illegal, but that is another matter. For our purpose here it is only necessary to note that the presence of college graduates in a wide variety of fields working for free indicates that there is not a generalized excessive unmet demand for their skills, no skill shortage that is generating wage inequalities. Globalization has, in fact, served to suppress wage growth for non-college-educated workers (roughly two-thirds of the workforce). However, such trends as import competition from low-wage countries did not naturally develop; they were pushed by trade agreements and the tolerance of misaligned and manipulated exchange rates that undercut U.S. producers. There are two sets of policies that have greatly contributed to wage stagnation that receive far too little attention. One set is aggregate factors, which include factors that lead to excessive unemployment and others that have driven the financialization of the economy and excessive executive pay growth (which fueled the doubling of the top 1 percent’s wage and income growth). The other set of factors are the business practices, eroded labor standards, and weakened labor market institutions that have suppressed wage growth. I will examine these in turn. Unemployment has remained substantially above full employment for much of the last 40 years, especially relative to the post-war period before then. Since high unemployment depresses wages more for low-wage than middle-wage workers and more for middle-wage than high-wage workers, these slack conditions generate wage inequality. This reinforces the need to achieve full employment, as delineated above. The excessive unemployment in recent decades reflects a monetary policy overly concerned about inflation relative to unemployment and hostile to any signs of wage growth. Budget policy has sometimes exacerbated our unemployment problem, as it has in the last few years at the state level, where budget cuts led to hundreds of thousands of public employee layoffs, and at the federal level, where deficit hysteria caused a failure to adequately focus on job creation to counter the recession and a weak recovery. The major forces behind the extraordinary income growth and the doubling of the top 1 percent’s income share since 1979 were the expansion of the finance sector (and escalating pay in that sector) and the remarkable growth of executive pay (CEO pay grew more than twice as fast as profits and three times faster than the pay of other very high-wage earners—the top 0.1 percent of wage earners).5 The increased incomes in finance and for executives do not reflect a corresponding increase in national output. Thus, restraining the growth of such income will not adversely affect the size of our economy. Moreover, the failure to restrain these incomes leaves less income available to the vast majority, the 90 percent of wage earners who have seen little wage growth since 1979. For these reasons—and not because of envy—we cannot ignore the top 1 percent as we seek to increase wages for the vast majority, because what the top 1 percent has taken in income growth largely has come at the expense of other income groups. There are various policies that can help to accomplish this. Tax preferences for executive pay can be eliminated or their use tied to the executive’s firm giving wage increases equal to productivity growth. Others have recommended tying corporate tax rates to the ratio of executive-to-median worker pay. Imposing a financial transactions tax can steer investments toward productive uses and away from speculation and restrain unproductive financial activity. The main reason wages at the lowest levels lag those at the middle has been the erosion of the value of the minimum wage, a policy undertaken in the 1980s that has never fully been reversed. The inflation-adjusted minimum wage is now about 25 percent below its 1968 level, despite the fact that productivity has doubled and the education and skills of those in the bottom fifth have greatly improved. Moving the minimum wage to $12.50 by 2020 would benefit about a third of the workforce directly and indirectly. Undocumented workers are vulnerable to exploitation. Consequently, they earn lower wages than workers who have greater access to legal protections and are able to switch jobs more readily. Executive actions, such as those the administration is pursuing, or comprehensive immigration reform that provides a path to citizenship are polices that will lift wages. Regularizing undocumented workers will not only lift their wages but will also lift wages of those working in the same fields of work. One way for employees to challenge discriminatory or unfair personnel practices and wages is to go to court or a government agency that oversees such discrimination. However, many large firms force their workers to give up their access to court and government agency remedies and agree to settle such disputes over wages and discrimination only in arbitration systems set up and overseen by the employers themselves. These systems can impose unaffordable costs on workers and limit their use of class actions. Such practices limit workers’ options and facilitate discrimination and violations of wage and hour laws. We have not only seen the erosion of protections in the labor standards set up in the New Deal, we have also seen the United States fail to adopt new labor standards that respond to emerging needs. In particular, there are standards needed to assist workers and their families to achieve a better balance between work and family. The most prominent examples are standards relating to earned sick leave and paid family leave. More support for child care is also necessary to assist workers and their families, especially low- and moderate-wage workers whose child care choices are limited and of uneven quality. Generating broader-based wage growth must also include efforts to close race and gender inequities that have been ever present in our labor markets. Many of the policies already mentioned—raising the minimum wage, updating overtime rules, pursuing full employment, legalizing undocumented workers, and increasing workers’ bargaining power—though not overtly race- or gender-based, would disproportionately raise wages for women and people of color who are more likely to work the kinds of jobs impacted by such policies. Beyond these broader efforts, we need consistently strong enforcement of antidiscrimination laws in the hiring, promotion and pay of women and minority workers. This includes greater transparency in the ways these decisions are made (including improved collection of pay data by race, ethnicity and gender) and insuring that the processes available for workers to pursue any violation of their rights are effective. Finally, we have to tackle social issues like mass incarceration that limit employment opportunities and pay for countless ex-offenders, particularly African American men. Improving adult education opportunities can help better integrate immigrant workers into our economy and our communities. Last summer, the president signed The Fair Pay and Safe Workplaces Executive Order, setting a new framework governing the awarding of federal contracts that the Department of Labor estimates will apply to 24,000 businesses employing 28 million workers. These new rules “will require prospective federal contractors to disclose labor law violations and will give agencies more guidance on how to consider labor violations when awarding federal contracts.” The framework “also ensures that workers are given the necessary information each pay period to verify the accuracy of their paycheck and workers who may have been sexually assaulted or had their civil rights violated get their day in court by putting an end to mandatory arbitration agreements at corporations with large federal contracts.”9 These new contracting rules can help reduce wage theft, obtain greater racial and gender equity and generally support wage growth. “A 2010 Government Accountability Office report found that almost two-thirds of the 50 largest wage and hour violations, and almost 40 percent of the 50 largest workplace health and safety penalties issued between 2005 and 2009 were at companies that went on to receive new government contracts.” There are good reasons, therefore, to go further than the new executive order and bar violators from federal contracts, as amendments to the defense and transportation appropriations bills in the House last year required. There are a variety of other policies that can support wage growth. Too many workers are deemed independent contractors by their employers when they are really employees. This is called “misclassification,” though Secretary of Labor Perez rightly labels this “wage fraud.” The consequence is less revenue collected by state and federal governments as well as workers lacking the important protections of the unemployment insurance and worker compensation systems. These practices are particularly severe in construction. Rampant misclassification also undercuts the ability of employers who follow the law to win bidded contracts, thereby lowering the wages of workers in their firms. Misclassification is perhaps best seen as part of the larger phenomena of “wage theft” where workers are not paid for the work they have done or are cheated out of overtime pay. We estimate that workers are cheated out of as much as $50 billion each year in wages to which they were entitled. Efforts to increase and improve labor standards enforcement, end misclassification (the Department of Labor has a multi-state initiative on this), and protect and strengthen prevailing wage laws can reduce wage theft and support wage growth. The failure of wages to grow cannot be cured through tax cuts. Claims are sometimes made that tax cuts propel long-run job gains and economic growth but in fact, tax cuts are not effective tools to promote growth. Even if they did create growth, it is clear that growth by itself will not lift wages of the typical worker. After all, we have seen plenty of productivity and GDP growth since 1973, but very little wage growth for the vast majority of workers. That is, tax cuts are a tried and failed policy that does not change the dynamics of the labor market so that workers will gain from productivity. Corporate tax reform, as discussed above, holds little promise of promoting economic growth, let alone generating wage growth. One should be mindful that while workers’ pay has been stagnant, corporate profits are reaching the highest levels in over four decades. In short, there is no basis for believing that expanded corporate profitability will necessarily benefit the typical worker. Personal income tax cuts are sometimes advocated as a way to provide some cash to ease the financial struggles of families. This is understandable, as such policies seem readily doable to congressional policymakers. The problem is that wage stagnation is an ongoing challenge and one-time tax cuts are, at best, a short-term Band-Aid. Moreover, tax cuts erode revenues needed for education, national defense, law enforcement, health research, and other unmet needs. The deficit reduction that began in 2011 torpedoed the recovery and is responsible for much of the enduring slack in the labor market. Measuring from the previous business cycle peak—so fully accounting for the Recovery Act and the following ad hoc stimulus measures—overall government spending today remains 6.5 percent below what it would have been if it had followed its trajectory over the 2001 business cycle. This is about $350 billion, enough to cost the economy about 3 million jobs. Facilitating more people attending and completing higher levels of education, or other types of training (e.g., apprenticeships) is very good policy. It can help fuel economic growth in the future, and it can expand access to better jobs for low- and middle-income children who would not otherwise have those opportunities. That is, improving education quality and attainment is critically important to promoting upward mobility, assuring today’s children have the opportunity to rise further up the income ladder than have their parents. The issue is not whether completing more education is “worth it” for certain individuals, but whether rapidly increasing the share of workers with greater education is an important tool to generate broad-based wage growth. But advancing education completion is not an effective overall policy to generate higher wages. Some who attain higher credentials will earn more. Recall that the wages of college graduates have been stagnant for over 10 years and the wages accepted by recent college graduates have been lower than those graduating in earlier years and with fewer employer-provided benefits. Let’s presume these trends persist for the next 10 years. This means that increasing college completion to any great degree will mean that the wages of college graduates will be falling, especially among men and newer graduates. 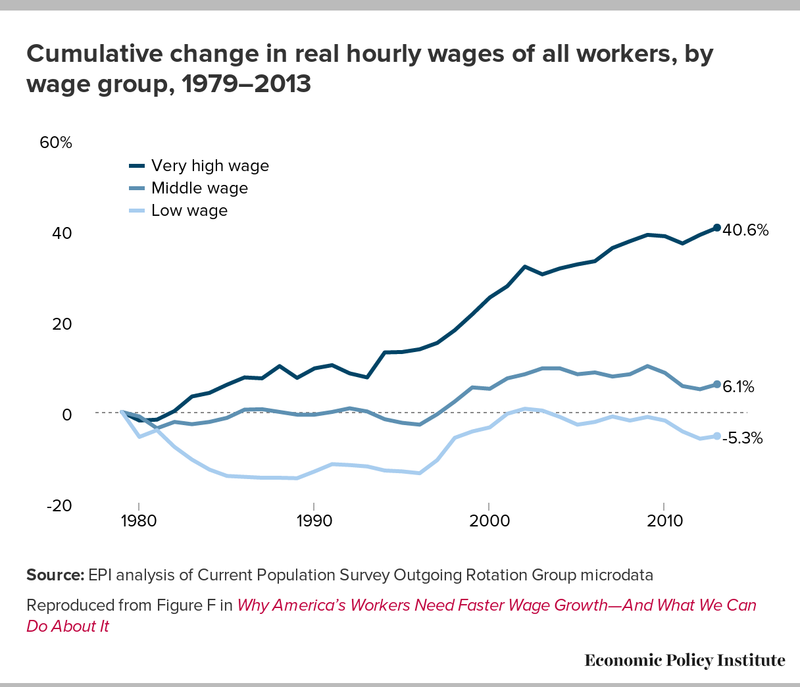 This will lead to less inequality, but it is not a generalized recipe for wage growth. There is no reason to believe that everyone who completes a college degree will be able to obtain a job that requires such an education. If not, college graduates will increasingly be used in jobs that those with less education now perform. The same analysis is true for community college completion. Providing access will help many attain the opportunities for jobs previously unavailable to low- and moderate-income students, facilitating intergenerational mobility. Community college graduates now earn 7.5 percent less than they did in 2004 and earn comparable wages to those in 1992, the earliest year for which we have data. The share of the workforce with community college degrees has expanded from 7.3 percent in 1992 to 10.8 percent in 2014, so the economy has absorbed substantially more of them. At the same time, the fact that the wages of community college graduates relative to high school graduates (i.e., the wage premium) has fallen and that the wage levels of community college graduates have fallen indicates that there is not a swelling unmet need for such graduates. This is an avenue to help some workers, but not a generalized approach to raising wages. What is needed are policies that lift wages of high school graduates, community college graduates, and college graduates, not simply a policy that changes the amount of workers in each category. There is no solid basis to believe that deregulation will lead to greater productivity growth or that doing so will lead to wage growth. Every major rule issued in the last decade was estimated by OMB to yield greater economic benefits than costs, and research suggests that the net benefits have been greater than originally estimated. Deregulation is a buzzword: the actual effects of any actual change in regulation have to be measured rule by rule. Deregulation of finance certainly was a major factor in the financial crisis and relaxing Dodd–Frank rules will only make our economy more susceptible to crisis. And of course, recent experience shows that reducing costs for business might translate into higher profits and CEO pay, but there is no mechanism to ensure that business cost savings will be shared with employees in the form of higher wages. Policies that can substantially help reduce unemployment in the next two years are welcomed and can serve to raise wage growth. Policies aimed at raising longer-term GDP growth prospects may be beneficial but will not help wages soon or necessarily lead to wage growth in future years. 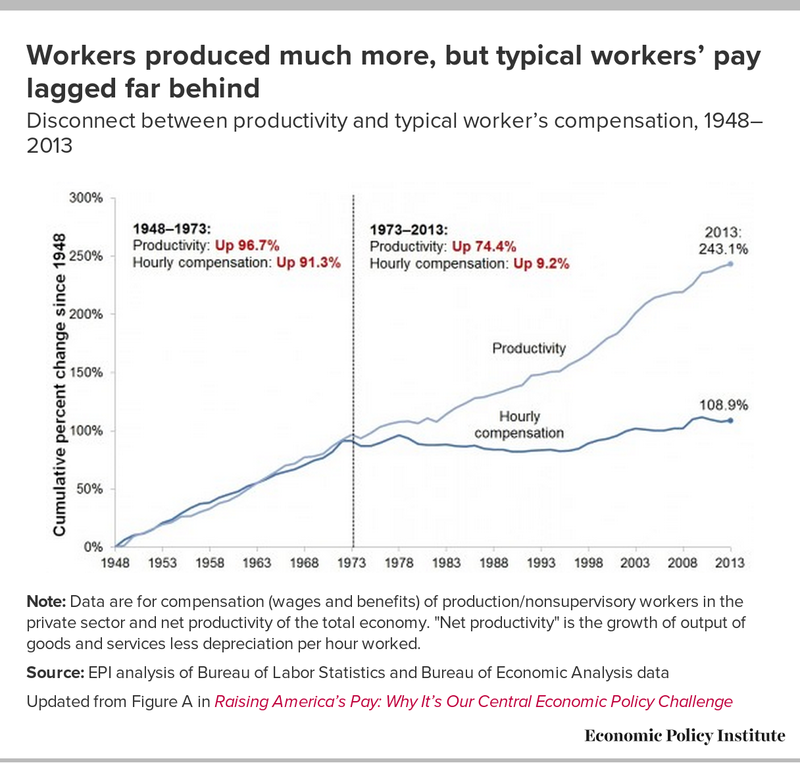 This can be seen in the decoupling of wage growth from productivity over the last 40 years. Simply increasing investments and productivity will not necessarily improve the wages of a typical worker. What is missing are mechanisms that relink productivity and wage growth. Without such policies, an agenda of “growth” is playing “pretend” when it comes to wages. Beaudry, Green, and Sands. 2013. The Great Reversal in the Demand for Skill and Cognitive Tasks. National Bureau of Economic Research Working Paper No. 18901. http://www.nber.org/papers/w18901. Autor, David.2014. Polanyi’s Paradox and the Shape of Economic Growth. MIT, Working Paper. http://economics.mit.edu/files/9835.